Congratulations on your new book, Ellen . . . it’s a bit hard to believe it’s time for Christmas stories already, though! Still, I’m looking forward to reading your new Cajun Christmas story. 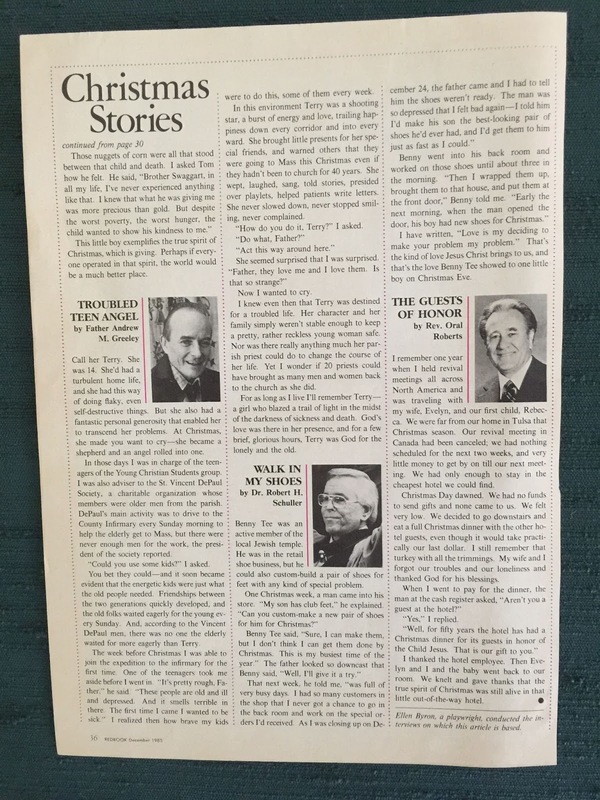 I’ve certainly heard of all the preachers you interviewed for your article, but a brief, unexpected meeting with Doctor Robert Schuller during a very difficult time was quite comforting, affirming, and uplifting. Faith is a very good thing to have . . . . It is! And there are days when I really have to remind myself of that. I wonder how much of the roteness of the responses you got was because they'd heard these questions before and how much was because they didn't want to be bothered. Sadly, it was probably more the latter. Still, I'm glad there was one stand out in each article that did speak to you. Mark, I think it was a combination. My impression was they were happy for the publicity, but just shared their go-to stories. That's why the two exceptions really stood out. Good morning, Jungle Reds and all. Just a puzzled reader: "yes, officially, it's the day after Halloween"? When did October 31 stop being "officially" Halloween? That means I will have to scrap my "old grumpy lady" costume and go into Advent Calendar mode. Eek! 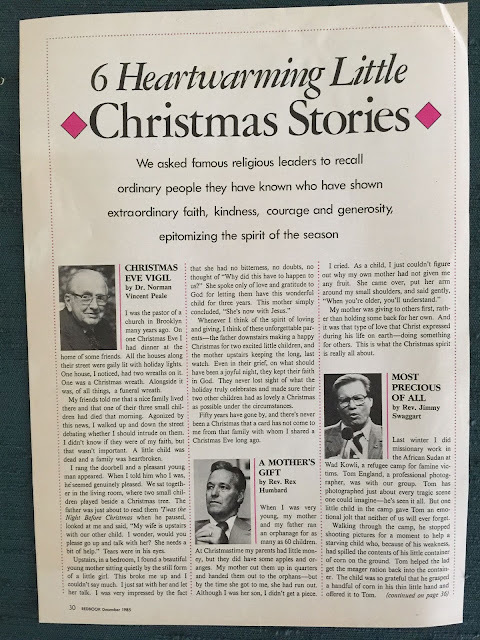 Thank you for your words on Christmas, Eileen, and to you, Deborah, for introducing me to yet another mystery series. So sorry about that! My brain was on Wednesday when I was writing that. Fixed now!! Your brain was in trick mode, not treat mode. Happy Halloween, Deborah! LOL, thank you PST! I missed that. Welcome, Ellen, and congrats on the new book. I certainly share your skepticism about the millionaire mega-preachers. I'm always interested in the ways in which writers integrate (or sneak) some faith elements into their books--yet another reason why Julia is such a big favorite--so I'll keep an eye out for yours. It's tough to have a Christmas book coming out - everyone will want to read it in December, but you have to get the word out beforehand, when we're all grumbling about rushing Christmas! 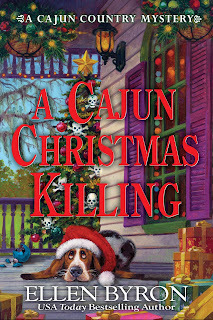 I confess I adore reading seasonal stories around the holidays, so I'll have to put A CAJUN CHRISTMAS KILLING on my list! And PS, I'm still out of power today, along with most of my town. Our little local library is back up and running, though, so I'm using their internet (and central heat!) for a while. God bless our local libraries! Yep! Jimmy would have been my guess too! A friend who happened to be struggling financially decided to try a new church. One woman--who was always perfectly coiffed, dressed, and made-up, was not especially welcoming. After services one cold day, she asked my friend to step into the restroom for a minute. Once inside, the woman told my friend that God had told her to give my friend her coat. My friend demurred, but the woman was insistent. And said, "But I told God, I LIKE this coat, so God nudged me harder." It made them both laugh, and my friend accepted the gift. Ellen, I too now have a new series to read--and I can pace them so that this one gets read over the holidays! Ellen, what moved me was the woman's honesty--revealing that she struggled with her conscience before offering her coat--and her tact--that she chose to do this privately--sparing my friend any possible humiliation AND foregoing any public acknowledgment of her kindness. That is an astonishing story. In so many ways. Wow. I am haunted by this. Thank you, Flora, for your friend's story. Kindness and caring and selflessness seem in small supply right now. Blessings. Thank you, Flora. What a great story. Congrats on the book, Ellen. I remember those days of televangelists. Flora, what a great story! Thanks, Mary. They're still around, but it's not what it once was.Interesting how that flamed out in terms of the zeitgeist. Sorry, I don't "ease into the Christmas Spirit" until Thanksgiving is past, and then, I admit, reluctantly. My wife and I see family on Thanksgiving, and send off gifts shortly thereafter, so we exchange a gift each on Christmas morning and that's it other than (real, live, voice) phone calls. We have cinnamon rolls for breakfast and a light evening meal. It's enough, and quiet and peaceful. That sounds lovely, R.K. Nothing beats quiet and peaceful, especially these days. Sorry about the timing of this post. I'm going to re-share it closer to the holidays. Hi, Ellen! I"m a fan! Recently finished your Plantation Shudders. Love your stories about your viewpoint shift after your contact with the real evangelists. Meeting real people is the best antidote to stereotypes, which I suppose is a great thing about magazine writing is it forces you out of your familiar circle of contacts. Thanks so much, Hallie!! Thrilled. :-) And yes, what a difference. At first I felt like I sold out because I needed the money, but it proved to be a great opportunity to grow as a person. me a boost of faith that I likely wouldn't have had without those moments. They weren't big flashy events just small signs that maybe there was a little bit more to the universe than skeptical me had acknowledged before. Thanks so much, Jenn, and right back at ya! And I totally feel the same way. I was once in the car with my parents driving into the city to meet friends of theirs. At the last minute, I impulsively got out of the car to go to the high school instead. Literally - as the light changed. They had an accident and if I'd stayed in that car, I wouldn't be writing this right now. I have to think, what was motivated that life-changing moment? Luck, intuition, or divine intervention? Ellen, that gave me goosebumps. Were your parents all right? Welcome, Ellen! What a trip to interview those religious leaders and their wives. Those mega-churches are fascinating because they're businesses, not just religious centers. Things get complicated when money, power, and faith mix. I saw that you live in Studio City, CA. What was your path from Cajun country to LA? Thanks, Ingrid! Boy, do things get complicated when money, power, and faith mix. Several of the men in my article ended up serving as a cautionary tale of exactly that. My path? 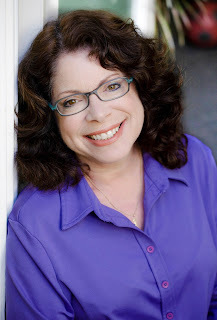 I went to college at Tulane, moved back to NYC, became a playwright and freelance magazine writer, then moved to Los Angeles to write for television. My dream is to one day divide my year between LA, NOLA, and NYC. I think I'll need to write a blockbuster to make that happen! HI, Ellen! You have so many adventures...DO you take photos of yourself with everyone? Hurray for your new book! Thanks so much, Hank! You'll laugh at this - I only have one photo of me with anyone I interviewed. It's of me with Frank Perdue from when I did a press junket to his low-fat chicken farm!! That's because it was a prearranged press tour. If I ever asked an article subject to take a photo with me, I'd most likely be fired. It's been fun reliving these adventures, I have to say. But I'm running out of stories!! I recently read Body on the Bayou and thoroughly enjoyed it! We lived in NE Ohio for some years and Akron seemed to be a beacon for televangelists. I knew a lady whose husband was a cameraman for Rex Humbard and travelled all over the world with him. His take was the man was sincere. His wife and family, not so much. I seem to remember his daughter's wedding being paid for by donations solicited for that purpose. That is so wrong. So Rex moved to Florida and Ernest Angley took over the property in Akron. Remember he of the bad rug? I honestly don't know about his convictions but it famously hailed in Germany once when he was not pleased with his reception there. Here in Houston we have the Osteens. No comment. I am not attracted to evangelists or mega churches. The only person I can think of whose sincerity and belief I do not question is Billy Graham. Thanks so much, Pat! So glad you enjoyed BODY ON THE BAYOU. Hope you like this one, too. Very interesting take on televangelists. My takeaway is that sincerity can be corrupted by money and power. That's why my conversation with Marvella Schuller was so refreshing. Either she was just a straight shooter or I got her on a good day for me. And I agree re: Billy Graham. I found out something interesting the other day doing a mystery trivia appearance at our local library. He was very good friends with Patricia Cornwell. I had no idea. I'm not usually one for Christmas centered mystery tales but I am intrigued by this one as I have been with the Vicky Delany Year Round Christmas mystery series. As for the religion aspect, all I can say is better you than me. I have little in the way of use for any religion. If it works for others I am happy for them, but for me George Carlin summed it up best in one of his stand ups when he said "I was catholic, until I reached the age of reason." Oh, and anyone who worked on Wings is A-OK in my book. Loved that show. LOL, Jay! Thanks so much. You may like this book because it's centered around a tradition unique to Cajun Country: bonfires on the levee. So it's a different twist on holiday traditions. And I LOVE George Carlin. My brother and I used to listen to the George Carlin routines at night and we did them verbatim at the dinner table...while my mother cringed. I have to admit to a soft spot for Christmas-themed mysteries. There's a jaded part of my brain that tries to sneer, "that's so cheesy" but the larger, sentimental part always manages to stare it down. I'm looking forward to reading A Cajun Christmas Killing. Like Jay, I have a lot of respect for your writing credit for Wings. But (almost embarrassed to admit this) what really gave me a little thrill was that you wrote on Fairly Odd Parents! It was huge when my son was the appropriate age, and I was always impressed at how clever the writing was. OMG, don't be embarrassed! I'm super proud of having written for FOP. Let me tell you, when I'm with a bunch of too-cool-for-school twentysomethings and they hear that credit, I am instantly the most popular person in the room. I LOVE it! BTW - since I missed yesterday's topic (31 hour power outage thanks to a storm) and it is unlikely my response would get read there now, I'm putting it here for anyone to read. I'm not one for dressing up on Halloween usually. People have asked me for years if I was dressing up and I would respond that I was dressing up as a nice guy who gives away free crap at my door! This year however, I found myself with invitations to two parties that required a costume (I haven't worn one since I was 15). The first one was originally themed as a "dress as the job you wish you had" but it got changed to a general theme. I couldn't think of anything so I just ended up getting a black cowboy hat and mask and went as the Masked Man In Black. The other party isn't until Dec. 2nd. The woman holding it is a HALLOWEEN FREAK. It is a Nightmare Before Christmas party to combine both "holidays". The costume theme is either an actual dead celebrity or a living celebrity done up as if they were dead. I'm going as Bob Ross, the painter of the "happy little trees" from PBS. As for what I'm doing this Halloween, I will be giving out the stuff at the door as always. It is the first Halloween without my mom so it will be interesting to see if any of the people coming to the door as about her as she always wanted to see the costumes. I give out the usual candy of course, but I also give out comic books as well. And I theme them to the costume the person if I can. A Star Wars costume gets a Star Wars comic book etc. I am actually known as "The Comic Book House" by the kids in the neighborhood. But that's not all. I give out special prizes for really good costumes as well. And this year I have Batman Pop vinyl figure for the first superhero costume of the night. There's a Star Wars action figure for the first Star Wars costume. I've got crayons for the younger kids, Magic The Gathering packages for the somewhat older kids and a few other trinkets as well. That's on top of the 600 comic books. I have one little girl who comes the house every year as a superhero and her mom told us last year that as soon as they step out of their house, the girl immediately asks, "When are we going to the Comic Book House?". This year, she gets a special choice between either a Wonder Woman or Supergirl action figure to go with her candy and comic. I get at least 200 kids at my door each year so the 5 big bags of candy comes in handy. I usually give out leftovers to friends afterwards and I give away some of the comics to the local barbershop and dentist office as well. All I can say is, I REALLY want to come to your house for Halloween!!!! now this is way cool. So very happy that children can find safe places to still have fun. Jay, I LOVE that you do this!!! What fun, and what a great way to connect with your neighborhood and make good memories for the kids. Jay, this is awesome! I knew you were a softie at heart! Congratulations on the Christmas book, Ellen, and it is in my sights as a Christmas read. Who can resist that sweet doggie on the cover? I don't envy you your assignment of dealing with the mega church preachers. I remember being in Acapulco years ago, staying at The Princess Hotel, where Jim Bakker and Tammy Faye and their children were also staying. They were usually having breakfast when my husband and I did, and Tammy Faye wore her full makeup, even on vacation. I just remember they always seemed super aware of themselves, like being in a play. At the time I felt a little sorry for them, but later, after learning what they were really about, that sympathy quickly dissipated. But, back to Christmas. I have actually started a Christmas reading list already, and the first book will probably be The Ghost of Christmas Past by Rhys. I am now adding A Cajun Christmas Killing to it. I also have some short story collections I'll be delving into. Thanks so much, Kathy. I hope you get to read my book. Gopher, the doggy, is a downright hero in a chapter! The story of the Bakkers' downfall is almost Shakespearean. Fascinating. And the son turned out to be an interesting character himself. Ellen, I meant to say how much I loved the dog on your cover! And to apologize for being so late to chime in today. Kayti and I both had doctor's appointments in Dallas this morning, so we took Wren out of school and took her to Northpark (Northpark Center is the oldest indoor mall in the country, is still privately owned, and has the most fabulous art and seasonal decorations) to see all the huge displays of pumpkins. And guess what? Today the pumpkins were going out and the Christmas decorations were going in! Halloween really is the beginning of Christmas, lol! AND I can't wait to read A Cajun Christmas Killing. In fact, I'll have to get it for my daughter to read first, as she and my son-in-law are crazy about NOLA. In fact, they are taking Wren for the Christmas caroling the middle of December. Deb, we did the caroling in Jackson Square two years ago! It was fantastic. Thousands of people coming together to carol by candlelight. Your daughter might really enjoy the bonfires on the levee, which happen Christmas Eve. But if she can't get there in person, hopefully my book will make her feel like she's getting a taste of it. And wow re: those pumpkins getting moved out already. Remember when Christmas prep didn't start until after Thanksgiving? If they keep pushing it back, we really will have Christmas in July eventually! Congratulations on A Cajun Christmas Killing, Ellen. It sounds wonderful. Can't wait to read it. Nothing like NOLA at Christmas. Thanks so much, Kait!! Hope you like it. Ellen, welcome to Jungle Reds! Happy book birthday! I already borrowed your book from the library. Now that Halloween is over, I am reading your book. Happy First Day of November. The book sounds so great. Thank you for sharing the post.